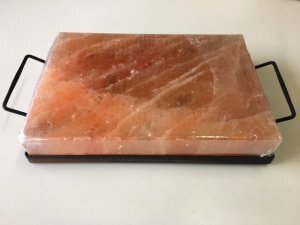 Using a Himalayan Salt block just got easier! Our salt blocks now come with a steel holder featuring two solid handles, making it easier to move your salt block. Transport your salt block from oven, BBQ, bench top with ease - simply grip the two handles and go (using protective wear on your hands if hot). Our holder is asthetically pleasing as well as practical. An added bonus of using a holder - it will keep your salt block all together should it start to show signs of wear and tear after a fair amount of use. Note: The holder is open underneath with steel edges holding the salt block in place. Your salt block is able to absorb the heat just the same as using no holder. This salt block is the same size and weight as the salt block we well individually on our website. 31cm x 21cm x 5cm approx. Himalayan Salt Blocks, Plates, and Bricks are nature's cook top and serving platter in one, offering many creative culinary uses while delivering the benefits of natural, pure salt with no chemicals or additives. Heat your Himalayan pink salt slab, plate, or brick to high temperatures and sear thinly sliced meats, fish, vegetables, seafood and other quick-cooking foods (see recipes below!). Or, chill it for use in serving sushi, appetizers, cold meats and cheeses, fresh fruit and vegetables, and even cold desserts. Flavourful and beautiful, these slabs are an exciting new way to cook and serve with salt! Check out the below to see how to use your Salt Block.